New circle lenses review sponsored by Geo coloured lenses, as you already noticed by the name they sell only Geo lenses, absolutely GENUINE (not like a lot of circle lenses shops that sell you replicas that will damage your eyes), it’s really important and I really appreciate the shop for this reason! They also offer free shipping worldwide and most of the lenses are available with prescription, another very important thing for myopic people like me who don't want to give up on cute lenses! Let’s start with the review, I chose Geo Nudy grey, I was always really unlucky with grey lenses ‘cause most of the times they suit me really bad, but this time I'm totally satisfied about them! I received the little parcel perfectly packed so you should not worry about your lenses! I also got a lens case, their cute business card and a little sheet with the instructions about how to wear lenses and their care routine! 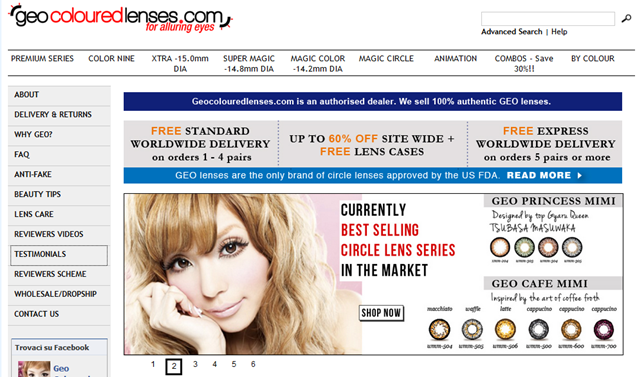 It’s really useful especially if you are totally new in the lenses world ^^! I really LOVE the texture of this lenses, it blends really well with dark eyes and the result is really special but still natural! The first thing I noticed is how my eyes look so big and the lenses are only 14,2 diameter *___* they seem a lot larger so you have a great effect without a super big lens that can bother your eyes! My eyes are really sensitive, I have a lot of cirle lenses but most of the time they are really annoying and I cannot wear them for a lot of hours, this pair is the MOST comfy pair I ever tried, I'm totally in love! They are not only beautiful but super comfy, now I want them in all colors! Color 5/5: I really like the color, the grey is really vibrant. Design 4/5: the design is really cute and special, maybe it'll suit better on light eyes but I like it also on my brown ones! Enlargement 5/5: they give a really big enlargement also if they're little! Comfort 5/5: they’re really comfortable, I highly recommend them if you have sensitive eyes. Dont' forget to check them HERE ! And lastly the outfit I wore while making pictures for the review! What do you thin about this lenses? Did you try the Nudy series from Geo? Oh, I was thinking about ordering new circle lens soon since mine died out half a year ago and I kind of want to have big dolly eyes again. Those lens really look great worn! I also like the texture as you said! <3 I also had grey ones who looked similar to yours but they didn't have such a nice pattern and actually didn't blend in dark eyes at all... Kind of disappointing, haha. 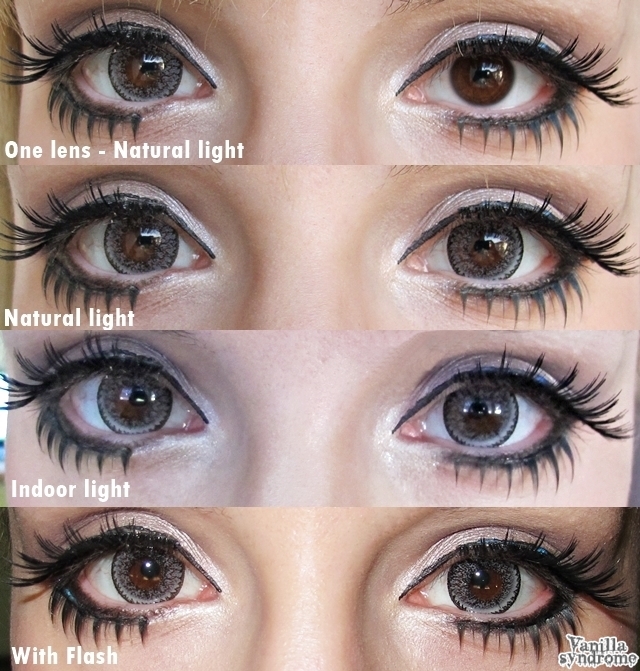 I'm glad you like the lenses *v* they're perfect on dark eyes! 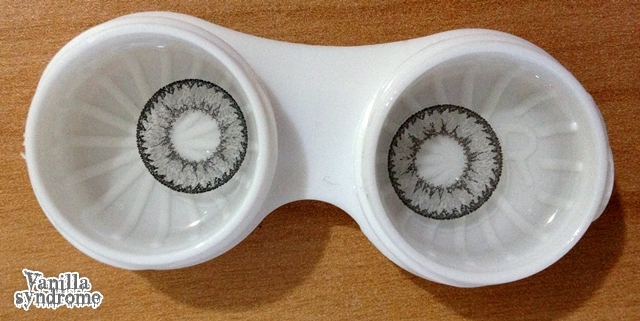 Wow, the lenses are so pretty! I am currently looking for a natural pair for work and so, I hope I will be able to find some!